If you have been into forex trading for a while, it is highly unlikely that you are unaware of how a lot of people make use of a reliable VPS in order to trade forex rather than using home PC. If you happen to be someone who are looking into the benefits of choosing a VPS for forex trading, then you have landed on the right page. The below mentioned information is going to help a great deal in the aforementioned regard. We have taken the liberty of mentioning a few of the prominent benefits that a VPS service has to offer over the home PC in order for you to make an informed decision. Without further ado, let’s take a closer look at the benefits that a VPS service has to offer to the forex traders and see if the benefits are of concern for you and whether or not it would be a commendable option for you to opt for a VPS service. There is no argument over the fact that it is of prime importance to have the finest speed of order execution specifically if you are making use of the automated trading systems. It is required therefore, to host the trading applications as close to the financial institutions, brokers, signal providers and account managers. And that is exactly what a VPS service that is hosted close to New York City in United States of America or London in the United Kingdom enables a forex trader to do. Ultra-low latency ensures that you are able to get the finest speed of order execution (reduce slippage) that may be available that may as well end up being highly profitable for you. It is to be kept in mind at all times that security and privacy have to be one of the most important elements that a forex trader must look for. No matter if you are making use of the general Meta trader platform or an advanced or more specific one as offered by your financial broker, you must take security and privacy of your operations very seriously. This is exactly what a VPS service enables a forex trader to do. It ensures that the trader won’t have to experience any kind of critical failure or a loop hole that may be used by the hackers in order to cause any kind of a threat or harm to the forex trader. Home PCs are easier to contact with virus due to higher usage of social media activity. Mixing personal & trading activities might sometime cause unnecessary issue – PC crash, low memory/priority on trading terminals and accidently closure of terminals. You may be aware of the fact that if a website is hosted from an office computer or a home PC, it is not as reliable as it would be if it were hosted from a VPS or dedicated hosting solution. This is absolutely true even if you are talking about the forex trading software. They are much more reliable provided that they are hosted from a VPS. A number of the VPS hosting solutions offer services like remote desktop RDP or VNC which are extremely convenient to be made use of and enable you to connect to your trading platform from anywhere around the world. There would be no amount of additional configuration or setup that you are going to have to take care of. VPS services does also enhance accessibility by ensuring that your trading platform is kept online at all times regardless of the reboots or even the disconnections that your local personal computer is going to go through. Furthermore, a VPS solution enables you to connect to the trading platform regardless of where you are or what device are you making use of in order to connect. The accessibility is certainly not going to be dependent on such elements anymore. Since a VPS service enables you to set up multiple accounts of platforms, it enables different users to view the desktop at the same time but from different locations. Last but not the least, most if not all of the VPS solutions that you are going to opt are known to offer upgrades on demand. This ensures that you don’t have to go for an upgrade until you have learned about it enough and have made a firm opinion that the upgrade is going to be of value for you. Provided that the upgrade offers features that you are not concerned with or it removes the features that you are using currently, you would not be required to make an upgrade and pay for it as well. In other words, as long as the upgrade has features to offer which are highly valuable for you and you would want to spend your money in order to get them, there is no obligation on you to spend even a penny on an upgrade. You are in charge of deciding what upgrade do you want and when do you want it. VPS solution offers a specialized network connection. Network are monitored 24/7, 365 a year constantly. This means that you will not need to worry any network outages or any unlikely unforeseen circumstances which disrupt your network such as Blackout. VPS have a high quality Internet connection back-up with multiple connections. In comparison a Home Internet connection has no backup and can vary in reliability. 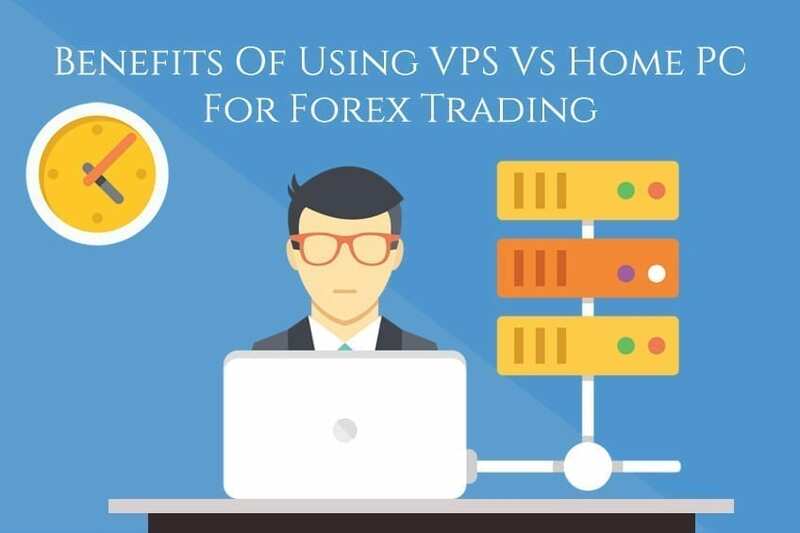 In the light of the information mentioned above, it can almost be taken for granted that there are a number of benefits that choosing a VPS solution has to offer to forex traders as against making use of the home PC. It is indispensable to mention here that a VPS service is certainly not an expensive one either. An ordinary forex trader is more than capable of expanding his monthly budget in order to get a VPS service that is going to offer all of the above mentioned amazing features. A perfect blend of quality, functionality, and affordability is what a VPS solution has to offer. With such a huge list of benefits at your disposal, what else could you possibly ask for? It won’t be wrong to state that you won’t have to be disappointed of making the decision of choosing a VPS service for your forex trading experience. Rest assured, you won’t have to regret making the decision of choosing a VPS for yourself. So what are you waiting for? Choose a reliable and affordable VPS solution now and see the difference that it casts on your forex trading experience for yourself. The usage is destined to convince you itself. Research Team – We do intensive and regular monitoring of any updates and information relevant and beneficial to our Virtual Private Server. Our team is highly devoted in offering tips and education article to all VPS users. Our goal is to ensure that we are always offering the best customized trading VPS for our clients.